For longer than I’ve been handicapping them, SAP SuccessFactors, Workday and Oracle have been battling each other hammer and tong to become the top provider of next-generation HCM cloud systems for large organizations everywhere. The stakes are enormous, with the opportunity to dominate the next wave of enterprise software. And the gloves are off: They regularly tell analysts under non-disclosure agreements which companies they’ve ‘taken away’ from each other. 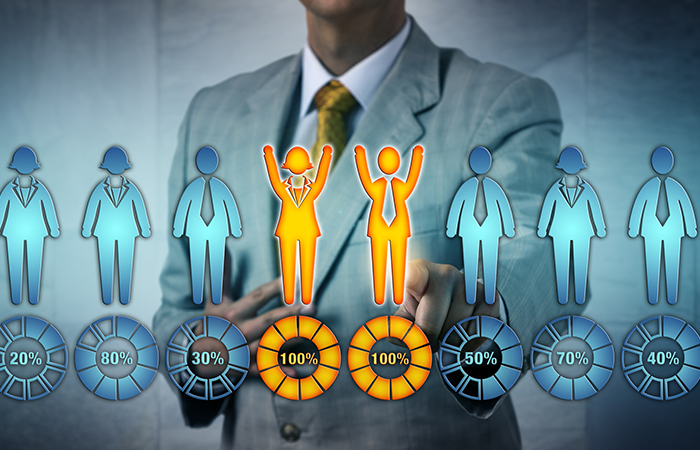 When the first of them entered the market, about 25,000 large organizations worldwide were running on-premise HCM systems, constituting their largest target market, though, amazingly, all three continue to find substantial companies running HR on spreadsheets! Which brings up this perplexing situation: Oracle has been selling Fusion (or Oracle HCM Cloud) for 10 years; Workday, likewise with Workday HCM; and SAP SuccessFactors, its core HR Employee Central, for seven years. Yet together the three have converted fewer than 6,000 of those 25,000 on-premise customers to the cloud—in a combined 27 years of selling! And this largely ignores the mid-market. Aneel replied that he thought modern computer architectures could absorb much bigger changes than what had been used before. But he admitted he’s still worried about some new thing he doesn’t see coming at him from behind. For years, Sierra-Cedar’s HR Systems Survey, the definitive poll on HR’s current and future technology plans, has shown that cloud adoption has been rising, albeit slowly. Of this year’s 1,312 survey respondents with more than 2,500 employees, 46 percent said they have a cloud core HRMS—up 5 percent from last year. Returning readers will notice I’ve abandoned the horse-race metaphor because we’ve used up all of the turns in the track! While I still have the three companies riding horses, the larger number of obstacles to clear in a steeplechase seems a more appropriate choice. To write this feature for the last 17 years, I’ve gone to Silicon Valley in July and August for full-day briefings with all three vendors (and many others), and with dozens of their executives at headquarters. This year, Oracle chose not to participate, so any information (below) is gathered from the public domain. I hope Oracle rejoins soon because the finish line is still many years away. They’re all innovating so rapidly that their many new products have already been covered in my regular monthly online columns: Workday in August and SAP SuccessFactors in September. All three are public companies following different fiscal years. So they announce the number of signed customers and the employees covered by those subscriptions at different times of the year and aggregate them differently. This makes a direct apples-to-apples comparison difficult. But handicapping must have numbers, so this is my best shot. The fact is, as Gartner’s Ron Hanscome points out: The three are now very close in number of customers sold, however, their sizes may vary. Is Workday Still Leading at the Water Jump? At Workday, Leighanne Levensaler, following eight years as the company’s product star—first running HCM applications and then supervising all others as senior vice president of product management—moved over 11 months ago to head corporate strategy. Among her many duties, she continues what Workday has been so good at: acquiring small firms with new technologies and the smart people behind them that the company needs to continue innovating. Previous acquisitions include Identified (data science), Platfora (data importing and visualization), Gridcraft (worksheet technology) and Medicore (video management). And most recently connecting with customers’ CRM systems with the acquisition of start-up Pattern, founded by former Google employees. Barbry McGann came out of PeopleSoft after stints at the old Andersen and Deloitte, before specializing in CRM (as in ‘customer- relationship management,’ not our ‘candidate-relationship management’) at Oracle. Barbry led Oracle’s acquisition of Siebel, then the leader in on-prem CRM, before the rise of Salesforce in the cloud. She headed one of the Workday software groups Leighanne supervised (payroll and time) for almost two years before being promoted to that position. So who is running HCM product strategy? Amy Wilson (see below) left about a year ago, after five years. She was replaced by Cristina Goldt, another PeopleSoft alumna for seven years starting in the 90s, and a Workday veteran for seven more. Great bench strength at Workday. SAP SuccessFactors numbers are very strong, especially in Europe and Asia. As of June 30, sales of Employee Central are up 48 percent year-over-year: 1,252 in 2016 to 1,850 in 2017—probably a nose away from Workday’s next announced number. By the same nose (call it a ‘smidge’), SAP SF moved ahead of Workday along the vision (innovation) axis in the Gartner MQ. If companies owning SuccessFactors cloud products (sold for more than a decade and now totaling more than 6,200 customers) are included, the total of subscribing employees is a whopping 48 million. But that’s not the proper comparison, since many talent-management customers may be using the other two competitors’ core HR. Instead, the company reports having 17.6 million EC subscribers, more than 5 million more than last year, both numbers as of June 30. New clients include EY (formerly Ernst & Young), Mohawk, Corning and Lufthansa. SAP SF had lots of high-level executive changes during the summer that seem unrelated. President Mike Ettling, who left on sabbatical, was replaced by 25-year SAP veteran Greg Tomb. Before leaving, Ettling filled two key positions with experienced outsiders: James F. Harvey took over as head of engineering and operations from Adam Kovalevsky, who left to join a start-up. In June, Amy Wilson took the head of global product slot deliberately left empty since late 2015 when Dmitri Krakovsky went to Google via its BeBop acquisition. There, he is ironically (or appropriately) producing new recruiting applications. James, Amy and Adam (plus Barbry and Cristina above) are all members of the PeopleSoft alumni network from the 1990s (its heyday) and now, in effect, run HCM in Silicon Valley. Obviously, that company’s alumni are everywhere at Workday, which was co-founded by PeopleSoft co-founder Dave Duffield and, in early days, had a $1 dollar penalty box for mistakenly calling the new company ‘PeopleSoft.’ Dave had to pay $5 when he misspoke. Another alumna is Oracle’s Divisional Vice President Gretchen Alarcon, who is in charge of all HCM products there, and her boss Chris Leone. So former PeopleSofties run products at all the Big Three. And they’ve all worked for or with each other since. James and Amy last worked together 14 years ago at PeopleSoft (just think of it as high school or college) on a financial product in opposite roles they occupy now: James on product and Amy on tech. Talented switch-hitters. After PeopleSoft, James went to Taleo where he created an original performance management application (including succession, goals, reviews, career development and more) and got it out the door in 11 months at a company that took nearly two years to do onboarding. And then went out to run sales for it! After Oracle acquired Taleo, James stayed for a while before rejoining Taleo’s former CEO Mike Gregoire at Computer Associates to direct much-needed software rebuilding and running two different $300-million divisions. His new job at SAP SF started in May, with 2,000 people eventually reporting to him. Amy has the distinction (shared with Workday’s Greg Thompson) of having completed an HCM quadfecta. After the PeopleSoft acquisition, she stayed at Oracle as one of Gretchen’s two lieutenants for product strategy and management. Then Dmitri and Leighanne simultaneously asked her to become their sole No. 2. She chose Workday and ran HCM applications for almost five years, including more than a year doing her job from Paris! After a year off, Amy took her new position running products at SAP SF in May, ironically a job she might have when Dmitri left had she accepted his earlier offer instead! But who knows? Amy has joined James in a large project that’s long overdue: better integration of the SuccessFactors modules (customers’ No. 1 request), especially the LMS (the former Plateau). And strengthening EC’s links with some of them. Ironically, after SAP bought SF, enormous resources were devoted to building out EC and integrating SAP’s on-prem HCM with SuccessFactors’ modules, but not so much to each other. Or to their technical heritage. Larry Ellison reported that Oracle sold more than $2 billion in annual recurring revenue for cloud software last year. But its biggest seller is Financials, not HCM, a fact you can see trumpeted in weekly front-page ads in The Wall Street Journal. Sometimes these ads focus on selling more CRM than Salesforce. Oracle reported 1,300 core HR customers last year, as of May 31. Then 1,600 at its February Analyst Day. On this year’s Wall Street end of-year earnings call, CEO Mark Hurd said it had signed, as of May 31, 325 or 326 additional clients. That totals 1,925 or 1,926. Of course, those numbers do not include subscribers to Taleo (about 2,000) or to one or more of Oracle’s Talent Management Cloud modules. Similar exclusions were made to SAP SF’s numbers. Oracle does not break out the number of core HR subscribers. Some new HCM customers last year include Fannie Mae, Ford and Hilton. In the Gartner MQ, Oracle moved up along both axes. If you want short-term predictions, the Sierra-Cedar survey has them. As always, the full report debuts at the HR Tech Conference. It had respondents from 319 medium and large organizations providing information on both their current core HR vendor and the solutions they plan to have implemented next year. The bullets below are not market share. Both numbers are percentages of the 8 percent of respondents who reported they will make a change or are evaluating a change to another of these three vendors. The first percentage represents what respondents are using now; the second represents what they might switch to in the next 12 months. Sierra-Cedar Vice President of Research and Analytics Stacey Harris points out these are respondents with 2,500 employees or more. Plus, historically, cloud solutions achieve only about half of the expected adoption predicted. Next year’s numbers, though, could be quite different. Last year all three announced new strategies focusing on selling to the burgeoning mid-market. This year they are actually executing their plans. Often these sales can be easier because customers have simply outgrown the capacity of whatever systems they’ve got! The cloud as the next generation of computing continues to take hold as its runway shrinks. Workday, SAP SuccessFactors and Oracle will continue competing for years to come with no certainty about who will win. Companies can measure quality of hire to better match candidates with jobs and reduce turnover.